I was recently approached by Williams-Sonoma about teaming up with them to spread the word about the wonders of juicing. You guys know I love our juicer, you can read a little bit more about when we got it here and a lot of you have been loving my DIY Blueprint Cleanse. I was intrigued by the idea they had to incorporate these juices in to a sangria as I wasn’t a fan of sangria because of the chunks of fruit. The thought of eliminating them and adding fresh juice to my favorite wine was an “aha” moment and I couldn’t wait to try it out. This stuff is SERIOUSLY amazing, we made it after a long trip to Buffalo Bill’s Training Camp and it was the perfect night cap to a long, hot summer day. 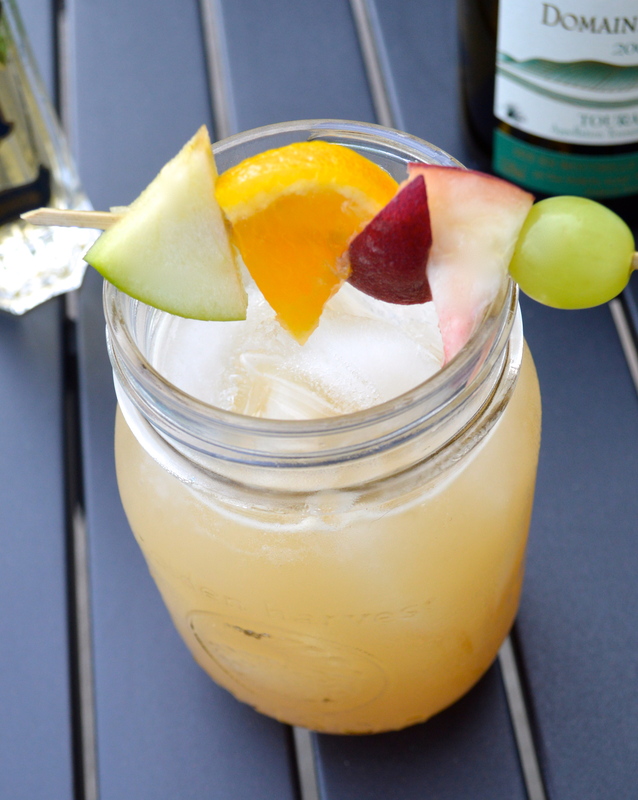 This takes the flavors of sangria and multiplies it tenfold making for a delicious cocktail that hits on all kinds of notes without knocking you over the head with fruit flavors… the juices make it just enough of each! The first thing I did was pick my ingredients. I knew I wanted to do a white sangria and I decided the best move was to pick the wine first, that way I could play off of the notes in the wine. This particular sauvignon blanc had notes of spicy lemon, orange, white flowers and light-citrus so I went from there. I love elderflower liquor in champagne and thought with the floral notes already in the wine it would make a nice pairing here as well. I then went for the fruits. Grapes seemed obvious with the wine thought I made sure to just use a small amount to accentuate the wine without overpowering it. 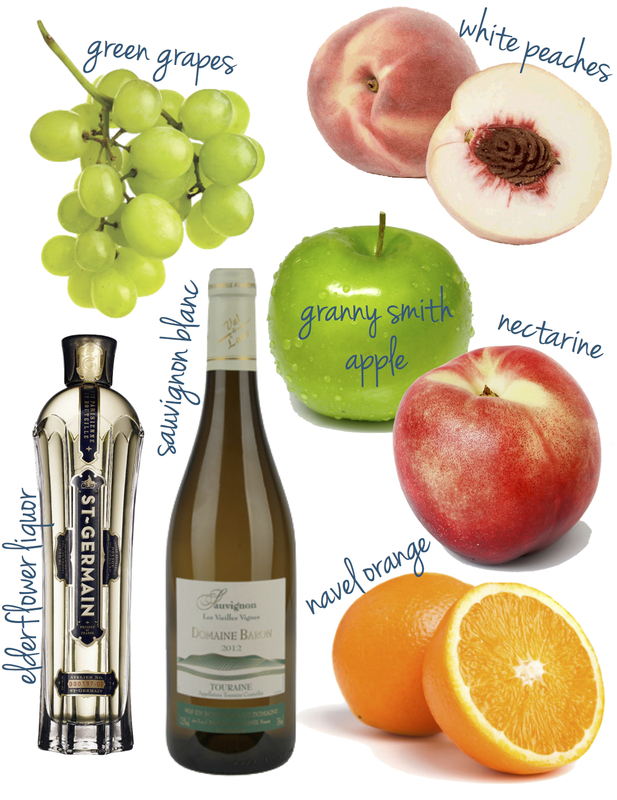 The orange was a bright citrus note I wanted to continue from the wine and the white peaches and nectarines are a must in any white sangria! 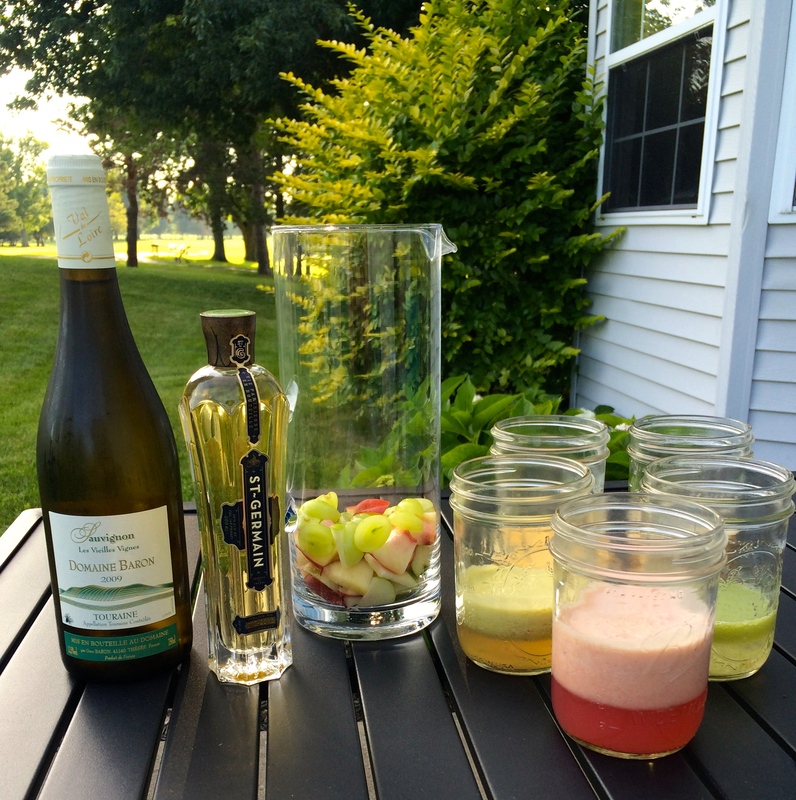 I then chose a granny smith apple to bring a tart flavor to the sangria since everything else was fairly sweet. The next step was to get juicing which was the fun part. I saved a few pieces of each fruit to put in the pitcher just for some extra color, and who doesn’t love some boozy fruit? Other than that I ran each ingredient through our juicer. 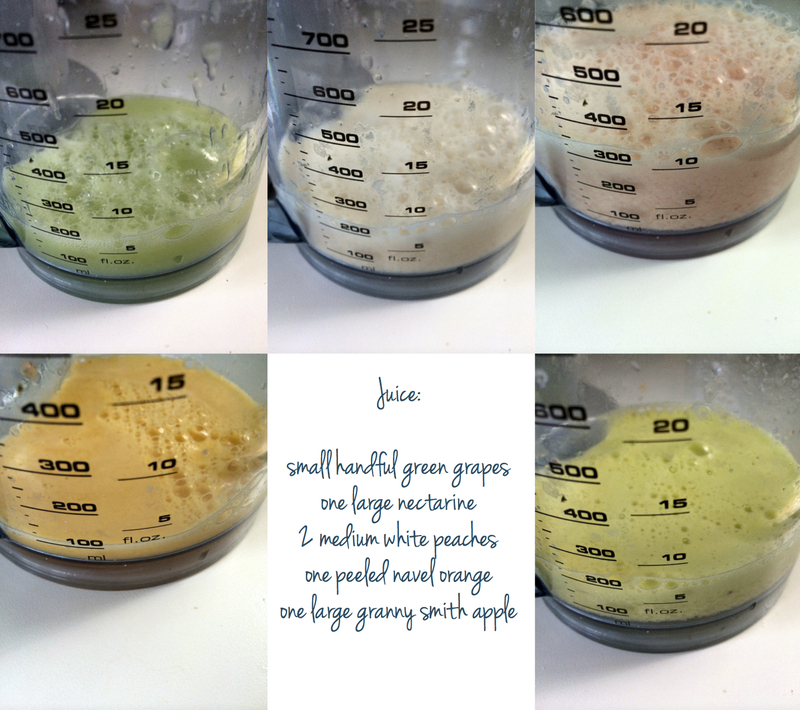 There are so many different options for juicers now and each one brings different flavors out of the same ingredients so it’s fun to play around a bit! If you haven’t ever juiced before, you’ll notice the foam on the top of the juices below. 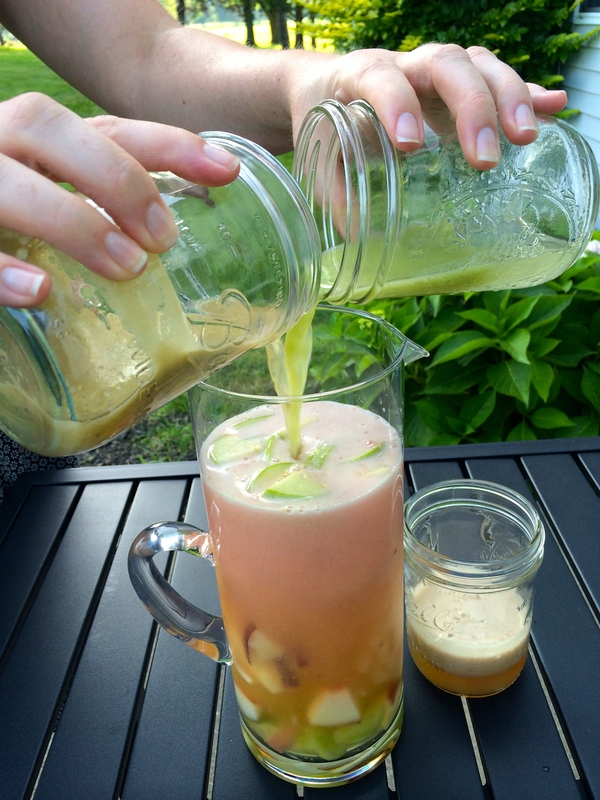 The juice separates almost immediately so I scooped the foam off the top of each juice before I added it to the sangria. It won’t hurt anything but it makes for a cloudy drink and if you want to avoid that, this small step works wonders. Next you can gather up all of your ingredients. I used a tall glass pitcher and filled it with my fruit pieces. You can skip that step if you like, I didn’t end up eating it but my husband loved it after it had soaked up the wine for a bit. You can see in the picture below how much the juice separates, this was before I scooped the foam off the top. Next you can add your wine to the pitcher. I made sure ours was nice and chilled because I didn’t wait to water down the sangria by having to add ice. Next I added in about 1/3 cup or so of the elderflower liquor. I then added my juices and gave everything a good stir. 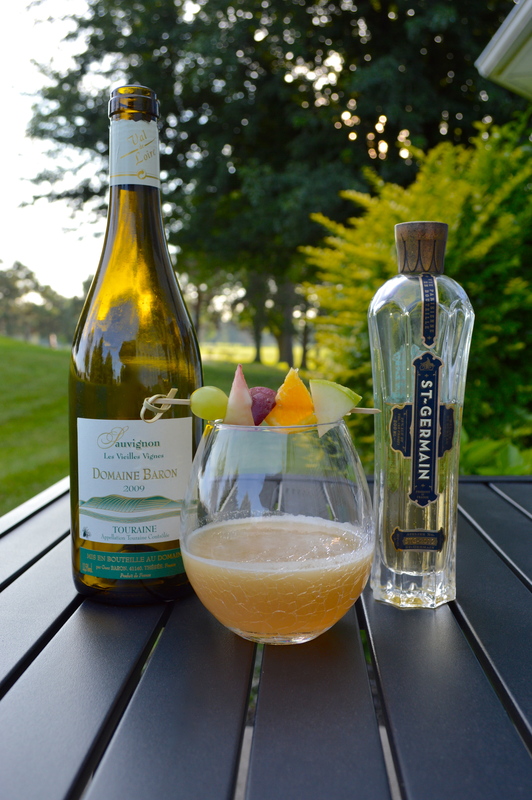 You can add a little skewer with some piece of fruit to garnish your glass for a little extra color. After a couple glasses and us sitting in the 90 degree heat the sangria got a little warm so we scooped some ice into mason jars and drank it right out of there! This is so delicious and refreshing and I am so happy to join Williams-Sonoma’s campaign to inspire people to start thinking outside the box when it comes to juicing! 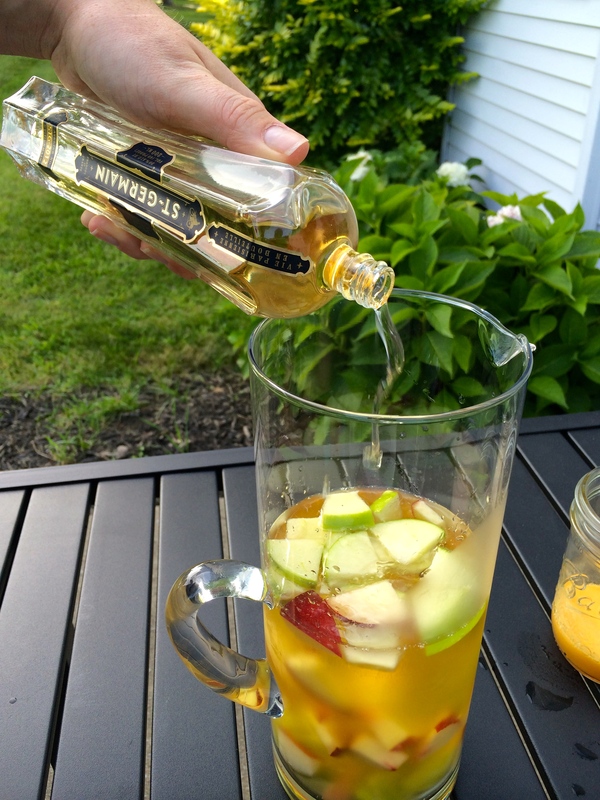 What are some of your favorite sangria ingredient combinations? I’d love for you to share as I’m itching to try one with red wine now!